Following a hugely successful year 2015 that saw them play to over 300.000 people around the world in support of their latest release Revolución, including a week-long stint in Cuba (a first for an American Rock Band), coveted slots at major festivals, shows with KISS, WHITESNAKE and JUDAS PRIEST in Europe, the US and Australia as well as their own, sold-out headline club tour through the UK and a celebrated headline show in Paris, THE DEAD DAISIES have signed an exclusive, global distribution deal with SPV Records. The Hanover, Germany based company looks back on 35 years of experience in bringing high-quality rock music to audiences worldwide, as evidenced recently in the highly successful reissues by the SCORPIONS. On top of this exciting announcement, THE DEAD DAISIES have also been confirmed as “SPECIAL GUEST” to Musikmesse Frankfurt, Europe’s biggest Music Trade Show. The band will perform on the Center Stage of the fairgrounds every day from April 7 – April 10, 2016 as well as a club performance during the show in Frankfurt. 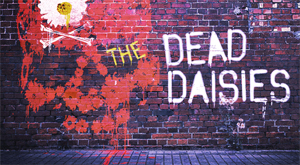 THE DEAD DAISIES, the biggest new name in Classic Rock, have just recently announced the addition of Doug Aldrich (WHITESNAKE, DIO) as their new lead guitar player. He completes a powerhouse lineup that features John Corabi(MOTLEY CRUE, THE SCREAM), Marco Mendoza (THIN LIZZY, WHITESNAKE), Brian Tichy (OZZY OSBOURNE, FOREIGNER) and David Lowy (RED PHOENIX, MINK). The band just began recording their new studio album with mega-producer Marti Frederiksen (AEROSMITH, DEF LEPPARD, MOTLEY CRUE, BUCKCHERRY) in Nashville. They will then embark on a massive world tour in support of this, yet untitled effort. The video for "Devil Out Of Time" was filmed on the European leg of the Revolución Tour and shows what THE DEAD DAISIES are all about: Classic Rock at it’s finest! Check out the video on KNAC.COM right HERE.